Anyone who does mastering needs to check out FG-X: it preserves punch and dynamic definition like nothing else. Superb loudness maximisation. Transparent at sensibly loud levels, and coherent at extreme ones! Useful enhancement controls. Excellent, easy-to-use compressor. Good, clear interface. No makeup gain on FG Comp. FG Level is very CPU-intensive. Maximising loudness is very much a part of contemporary mastering, and it's typically done using limiters, clipping, saturation or a combination thereof. Dissatisfied with these approaches, Steven Slate and Fabrice Gabriel of Slate Digital put their heads together to devise an alternative: FG-X. 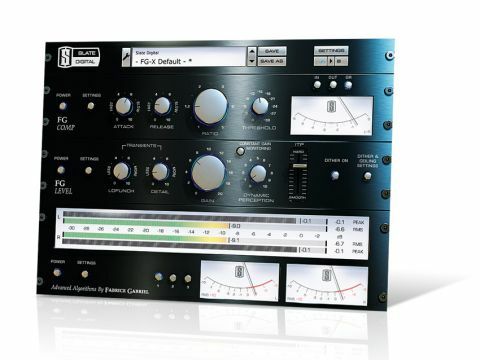 This is a single plug-in that houses FG Comp, a master bus compressor, and FG Level, which offers a new type of maximisation called Intelligent Transient Preservation (ITP), a sort of smart saturation process. Rounding it off are peak, RMS and VU meters. Once you've set FG Level's Gain knob to achieve the desired level, it's important to set the ITP slider to suit the material. It's a bit like a limiter's release time: too 'slow' and transients can lack snap; too 'fast' and distortion can occur. The sound can optionally be enhanced with the Lo Punch/Detail (bass/treble transients) parameters and the novel Dynamic Perception process, which makes mix dynamics more 'lively'. These can be handy for shining up good mixes and great for reviving lacklustre ones. FG Comp's controls are dead simple: Attack and Release (ranging from 'slow' to 'fast'), Ratio (up to 20:1) and Threshold. Unlike a lot of compressors, the gain reduction meter is set to show a very small range of just 3dB by default, which is spot-on for most mastering situations. That's a sensible touch. Sonically, FG Comp is audio butter - it's one of the smoothest, most transparent compressors we've heard. It's hard to make it pump, yet somehow it still grabs the transients in all the right places. We found it equally adept at providing subtle mix 'glue', gentle level riding, and giving material a 'compressed' feel without being obnoxious. Interestingly, it's one of the few master bus compressors we've found to be useful with complex, full-on material like extreme metal, as it can control these mixes without simply overreacting. Oh, and it's worth a try on instruments, too - we like what it can do on a drums bus, for instance. We tested FG-X on material in a range of modern genres, from indie, rock and metal to DnB and hard dance. At sensibly loud levels (eg, up to -9dB RMS), FG_X had the edge over other loudness processors we tried - even beating our previous favourite, Ozone 4's limiter. With limiters, mix elements are always jostling for attention; for example, chugging guitars can sink back slightly behind thudding kick drums. Not so with FG-X: elements stay focused and locked in their places, and the bass remains solid. Those guitar chugs, for instance, stay right up in your face. FG-X is very transparent indeed. With a decent mix, we had no problems getting our masters up to commercial levels. We even tried FG-X on some unmastered mixes of commercial tracks, and the results quickly exceeded the original released versions, which had used painstakingly dialled-in plug-in chains to get the levels up. FG-X was less squashed, more punchy, and more like the original mix. In fact, we could even get it sounding a little louder! If you crave extreme levels (say, up to a deafening -5dB RMS), FG-X will comply with your instructions, but you'll get some treble distortion and audible transient saturation. Even so, the results are preferable to the nauseating pumping of a limiter or the hard-to-control distortion of clipping/saturation. Overall, FG-X entirely fulfils its remit and sets a new standard in loudness maximisation, delivering some neat dynamic-shaping options on the side. FG-X does require that your mixes are of a certain standard in order to work its magic, so if you're still learning the ropes of mixing, you might not reap the benefits of it. If that's not you, you simply have to try FG-X. DnB build-up - SLAMMED REALLY HARD!